This year brings news both on the movie franchise front and on the LEGO toy front. 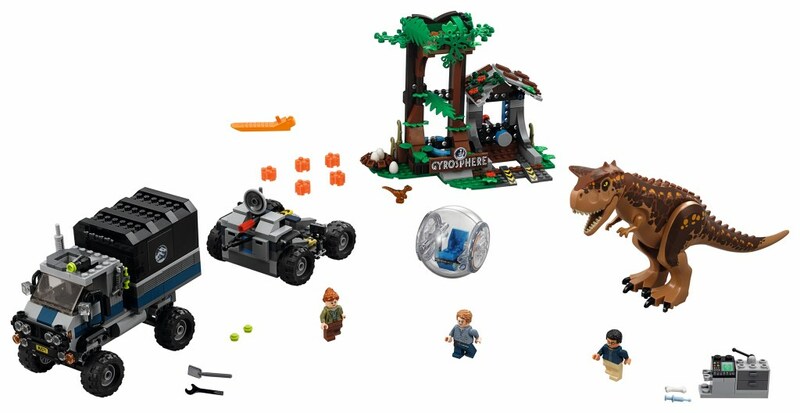 LEGO will release a new series of sets on their roster: the LEGO Fallen Kingdom sets. This will be a new subtheme inside the LEGO Jurassic World universe of the popular Danish toy company. You can read more about each Fallen Kingdom set at BrickPals.com. What should we expect from the LEGO Fallen Kingdom sets? Well, certainly lots of new dinosaurs in LEGO format. But there's more than that as well, because this time, LEGO brings sets not only for older teens and even adults but for children as young as four as well. As most of the sets in LEGO themes, these revolve around the main theme of the movie: Isla Nublar is at risk. Mount Sibo, the volcano in the island, is about to erupt and drive dinosaurs extinct -- again. The sets in the LEGO Fallen Kingdom line are about either rescues or escapes, as the dinosaurs leave their enclosures and as our fearless heroes try to her them (or so it seems) and take them to safety. 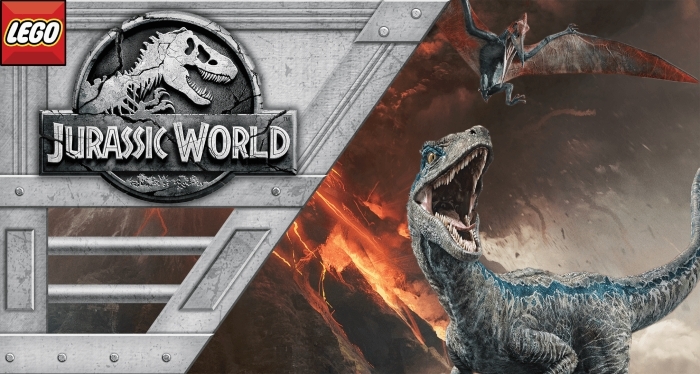 There will be lots of vehicles, guards and weaponry involved in these sets, as well as a new hybrid species: the Indoraptor. But we'll talk about him later. Of course, the best part of any Jurassic World (or Park) related stuff is the dinosaurs, so let's take a look at the ones we can expect to see this year in LEGO format. The Carnotaurus is part of the Jurassic World since the first movie, as part of its DNA made the Indominus Rex. In the new movie, we get the dinosaur itself, and LEGO is no different. This horned predator appears in the LEGO 75929 Carnotaurus Gyrosphere Escape set, which seems to follow a similar scene shown in the trailers. 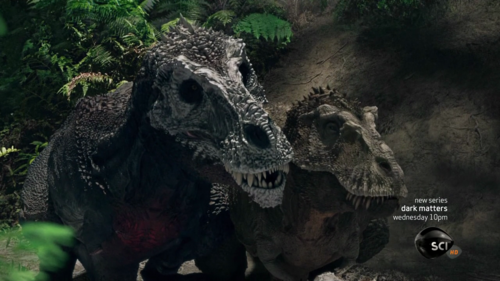 These magnificent animals are a staple in the Jurassic Park and now Jurassic World franchise. The massive predator is one of the most well-known dinosaurs ever, so it's no wonder they appear in two sets, one of them being in the DUPLO series (LEGO 10880) and one in the Juniors series (LEGO 10758). As both are aimed at very young children, the events portrayed in the sets don't really seem to echo the new movie as much. The Pteranodon isn't exactly a dinosaur, but a large flying reptile belonging to the Pterosaur order. Still, it's close enough to count here! This flying animal appears in two sets, one of them being in the Juniors line of sets. Both of them have the name Pteranodon Escape, but they have different LEGO numbers and contents. In the Systems set, aimed at older children, we have a jeep, a net, and two minifigures, including Owen. In the Juniors set, we have two guards, something suggesting lava and a volcano, and a helicopter with a chain. These dinosaurs are very popular and common in the Jurassic Park and Jurassic World franchises, and it's no wonder they're here. In the movies, they're called Velociraptors (raptors for short), but in the real world, velociraptors are much smaller. The closest match to the Velociraptors in the movie is the Dakotaraptor, found in Montana in 2015. The Raptor appears in at least one set, by itself (LEGO 10757 Raptor Rescue Truck), a Juniors set. However, one specific raptor, Blue, appears in another two sets. This Pachycephalosaurus relative resembles its more popular relative but has spikes on the back of its skull. This rather nice-looking dinosaur appears in LEGO 75927 Stygimoloch Breakout set, alongside an enclosure that presumably held it. Owen's favourite Velociraptor, Blue, appears in two sets as well, one together with the Indoraptor (LEGO 75930) and one by herself, titled LEGO 75928 Blue’s Helicopter Pursuit. This one includes Blue herself, a helicopter, an egg, and more. There is an Apatosaur/Brachiosaur miniature in one of the DUPLO sets, as well as a Triceratops. These do not have their own set but come together in the LEGO 10879 Gentle Giants Petting Zoo. There also seems to be a Triceratops skull of sorts in the LEGO 75930 Indoraptor Rampage at Lockwood Estate set. 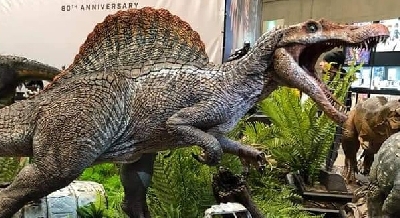 This dinosaur is original to Jurassic World 2: Fallen Kingdom and it seems to be the product of a mix between the raptors and the Indominus Rex. It's smaller than the latter and bears a strong resemblance to the raptors. 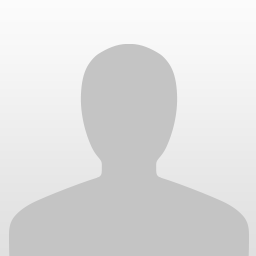 This dinosaur is dark in colour, almost black, and is the first male dinosaur in the franchise. In the second movie trailer, it appears in a fight with Blue. This dinosaur appears in the biggest known LEGO Fallen Kingdom set, the LEGO 75930 Indoraptor Rampage at Lockwood Estate. 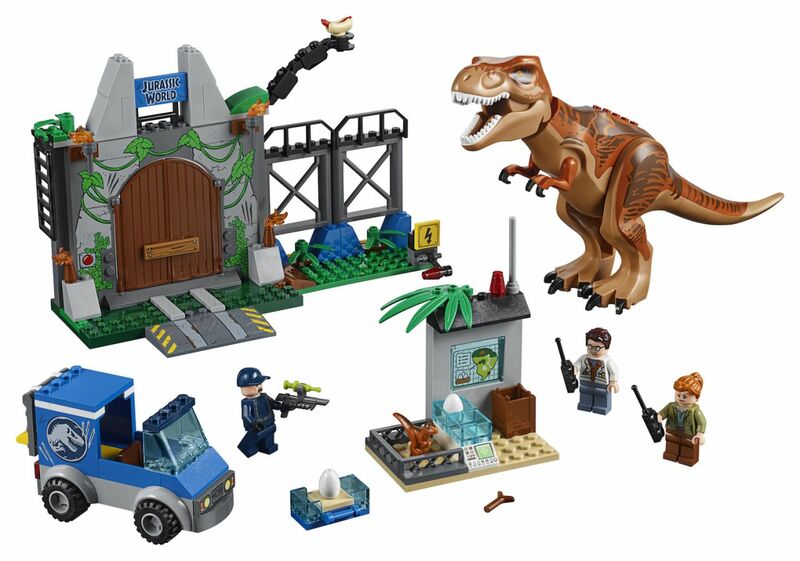 This set has over 1,000 pieces and includes a building as well as the dinosaurs (including Blue), Owen's bike, and much more. Many sets come with eggs, suggesting they are somehow involved in the plot of the new movie. While the trailers don't really show anything around this subject, their strong presence in the LEGO sets might suggest that, like in the previous Jurassic Parks, life found a way and they managed to reproduce. 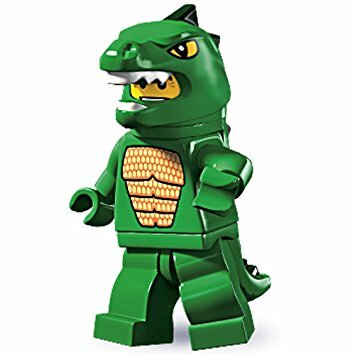 This is what we know about the LEGO Fallen Kingdom sets for now! There's a lot of speculation flying around, so stay tuned for more news. The sets look great but God they're overpriced.